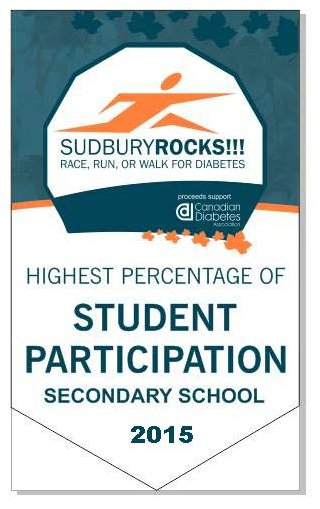 Why: Awards plus bragging rights of Sudbury’s Most Active School! 1. Choose your school team leader! The leader will organize the team which would include printing off registration forms and ensuring students fill them out, collecting all forms and supply to the race organizers. The leader would also coordinate pledge raising and collect all pledge forms and donations and supply to the race organizers. 3. Start fundraising! See CANADIAN DIABETES ASSOCIATION page for details on how you can do this - or DOWNLOAD PLEDGE FORM HERE! *Students who participate in the School Challenge are encouraged to wear school spirit clothing to identify them. 5. Make sure your team members know that they must write SCHOOL NAME across the top of their pledge form when handed in at the Race Expo. *Any pledges handed in AFTER the Race Expo on May 10th will NOT count towards the School Challenge contest. 6. Celebrate Mothers while supporting diabetes on May 11th with your school spirit proudly showing!